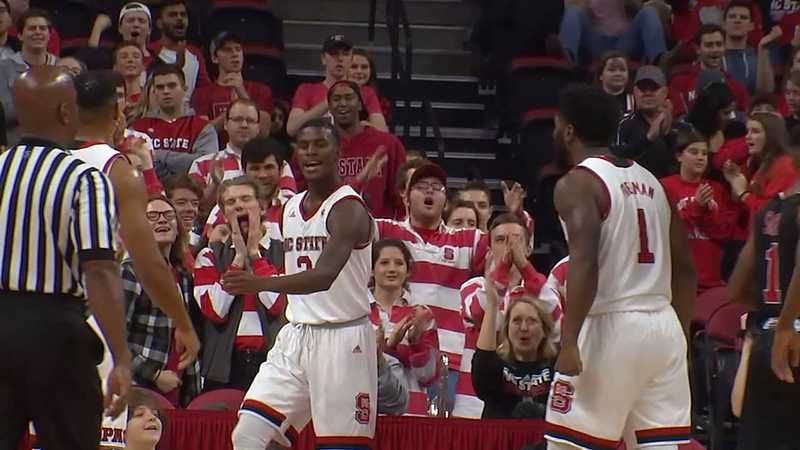 NC State's Lavar Batts is fired up after a driving score as Lennard Freeman looks on Friday. RALEIGH, North Carolina (WTVD) -- Kevin Keatts' debut as North Carolina State's head coach went just as he planned. "I was really impressed with our balanced scoring," Keatts said. "Pretty much everybody who got in the game affected the game in a positive way. I thought we really shared the basketball." NC State got the Kevin Keatts era off to a good start with a 102-67 win over VMI on Friday. The Wolfpack shot 51 percent from the floor, including 54 percent in the first half as they took a 56-34 lead into halftime. Markell Johnson scored 14 points and Omer Yurtseven had 13 points for N.C. State. Bubba Parham scored 17 of his 22 points in the second half to lead VMI. Tyler Creammer and Keith Smith added 10 points each for the Keydets. VMI shot just 36 percent, including 4 of 20 from 3-point range. "We did exactly what I wanted to do on the defensive end," Keatts said. "I thought it was a great start." VMI: The Keydets knew they had some retooling to do after losing four of their top five scorers from a year ago. They started four sophomores and a freshman against N.C. State, and the inexperience was evident in their slow start to the game. "It took awhile for us to get our feet under us," VMI coach Dan Earl said. "But once we did, I thought we did a better job of attacking in the second half." N.C. State: As advertised, the Wolfpack have a quicker tempo under Keatts. They pressed after made baskets and trapped after a missed free throw on one occasion. N.C. State forced 21 turnovers and dominated inside, just what it was supposed to do on its home floor against an overmatched opponent. "I love getting up and down, and I know my whole team loves it," Johnson said. "We're going to keep continuing to push it." N.C. State's Shaun Kirk entered the game with 2:54 remaining in the first half and promptly made his presence felt. On N.C. State's next possession, he sneaked behind VMI's defense for an impressive one-handed dunk along the right baseline to give the Wolfpack a 48-28 lead. VMI played without Armani Branch, its leading returning scorer. Branch missed the game with an undisclosed injury. N.C. State was without Abdul-Malik Abu, its leading returning scorer and rebounder. Abu suffered a sprained knee last month and has been declared out for the Wolfpack's first two games of the season. N.C. State outscored VMI 56-24 in the paint. . Parham made all 12 of his free throws, including nine in the second half. . Keatts said senior walk-on Tucker Thompson, who played a total of 7 minutes last season, has left the team to focus on his academics. VMI plays at Duquesne on Tuesday before playing its home opener against Presbyterian on Nov. 18. N.C. State hosts Charleston Southern on Sunday in the second leg of a four-game homestand to open the season.